Entry to record 6 months’ interest and discount amortization of bond payable. The company incurs a $38,790 bond interest expense each period but only pays out $30,000 in cash because the remaining $8,790 will be repaid when the bond becomes due. This $8,790 credit to Discount on Bonds Payable account increases the bonds’ carrying value because it is a contra-asset account, which is subtracted from the Bond Payable account. The below table shows the decreases in the Discount on Bond Payable along with increase in bond’s carrying value each period. *Note that upon the end of the life of the bond payable (December 31st, 2011), the unamortized discount equals $0. **Note that the carrying value of the bond upon the end of its life (December 31st, 2011) becomes equal to par value of $1,000,000. This graph shows the monthly cash interest payments allocated in to the total interest payment (the static $30,000) and $8,790 that is amortized from bond discount. 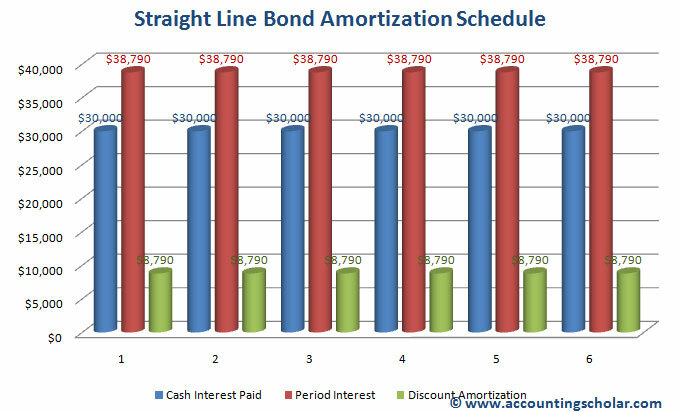 As you can see, the figures remain the same throughout the 6 payment periods due to the straight-line amortization method. Below, you will see the numbers will change for the effective interest method because we will be amortizing the discount on bonds payable at effective market interest rate, instead of a constant rate. Note: We have a $403.16 unamortized discount because of rounding issues, but normally most companies would use automated amortization schedules that will take care of rounding issues leaving no variance. 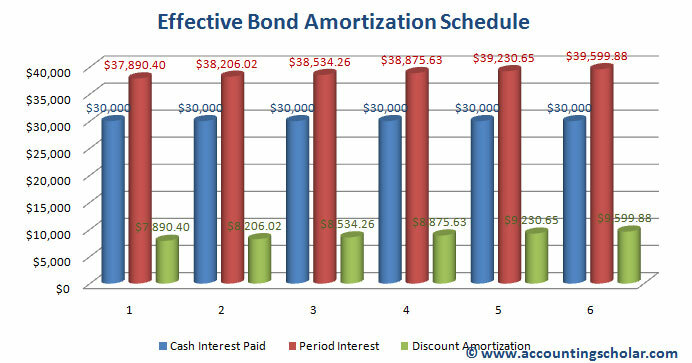 This graph (above) shows the bond amortization schedule calculated using the effective market interest rate as opposed to the Straight-line amortization method (above) that uses the static bond coupon rate to calculate the monthly interest payments. The effective interest method allocates bond interest expense over the life of the bonds in such a way that it yields a constant rate of interest, which in turn is the market rate of interest at the date of issue of bonds.